Personalization. It’s about the hottest topic out there for digital marketers. If you’re going to do it, though, you need to know with which customers you should start your personalization efforts. 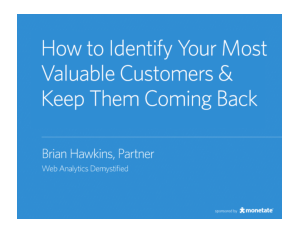 Which means you need to know which of your customers are most valuable—not always an easy task. This white paper will teach you how to identify your most valuable customers, create a personalized experience for them, optimize that experience, and begin the process again with another customer segment. Also included are three real-life examples of companies that found their most valuable customers, focused on personalizing their relationships with them, and drove additional business, increased customer loyalty and improved customer retention.